Wednesday was another busy day with lectures from a distinguished sociologist, a visit to a Cuban elementary school and to the University of Havana, and the opportunity to meet with the director of an after-school program providing athletic and other opportunities for young men and women on the streets. Marta Nunez retired three years ago after 50 years on the sociology faculty at the University of Havana. She proved to be a treasure trove of information all things cultural and Cuban. 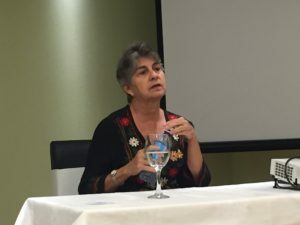 Her particular interest focuses on the place of women in Cuban life, but she also offered keen insights in racism and inequality on the island. Cuba is a highly homophobic society that has had to battle against discrimination based on sexual orientation. Oddly, however, having analyzed 17 years of Cuban television programming, she found that treatment of gay men and women in these shows was quite sympathetic. And in December 2014, at an international Cuban film festival, film goers voted “Bridal Gown or Wedding Gown,” a film about a woman trapped inside a man’s body, as the most popular film in the festival. Nevertheless, families encourage boys to play after school and to spar and box, so that they can avoid the label of “sissie,” while girls are required to work in the house and do well in school. Equality for women, especially professional women, is a major issue. Women make up 40% of the workforce, but 66% of all professionals. But when women get home, they are expected to go to their second job of doing housework. Of 51 universities on the island, only 8 of the chancellors are women, although they make up 60% of the faculty. Domestic violence is an issue, due to machismo, but for men to beat their wives is a risky business. Due to the housing shortage, when couples marry, they move in with the bride’s family. Beating a woman in her own house, is likely to get the man evicted. Private ownership of guns is not allowed in Cuba, which minimizes fatal domestic encounters. Teenage pregnancy exists, but it is minimized in Cuba because abortion is completely legal and above board and contraception is widely available. Racism is a challenge. The belief that white skin is more desirable is pervasive. Asked the color of their skin on regular censuses and 66% of Cubans report they are white – a nonsensical finding as common experience in Cuba demonstrates. Inequality remains a challenge, in some ways grounded in decisions made shortly after the revolution. In 1959, all Cubans were given the dwelling in which they lived. The dwelling could be one room, or a small apartment in a larger building, or a mansion. Ownership passed down through generations helped accentuate this inequality. Meanwhile, while citizens are paid in Cuban pesos, Cuban exiles frequently send “remittances” to family members in more valuable dollars. The exiles are typically white, so the remittances become a ratchet that cranks inequality to new levels. “Housing, transportation, and low pay are the major challenges facing Cuba 50 years after the revolution,” concluded Nunez.